My husband brought home a couple of gifts for the children this fall. (We set them aside for Christmas gifts.) 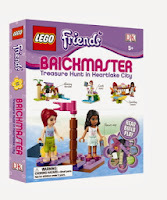 He found the Brickmaster Friends (for girls) and Brickmaster City. Each of these books is more of a kit with a book-and-bricks-within-a-book. He found them for $20 each at BJ's (which is like Costco). It was a good deal and totally worth it! They will be thrilled with these books as Christmas gifts. Shortly after my husband brought home the Brickmaster books, DK Publishing surprised me with two LEGO books at my door. Both would make a fabulous gift for any LEGO lover. LEGO Minifigure Year by Year: A Visual History is a book that is especially good for those who have been collecting for more than a couple of years. It is truly a beautiful book full of the rich LEGO history. It is a bit like a timeline with all sorts of facts and images in the 250+ page book. Lego Minifigure Year by Year really explains how LEGOs have evolved over time. I spent a great deal of time reading this fascinating book, and I didn't even own LEGOs as a child. My husband has really appreciated it, as would other adults. I think older children will enjoy this book, but it's really those who have experience the history who will love it. Though it does come with three minifigures, the real joy is within the book with all the facts and trivia. 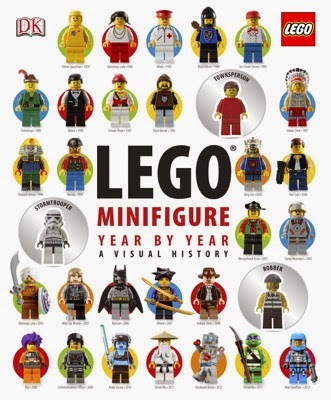 I think this book embraces the changes of the minifigures while showing each minifigure's personality. This is a book I know I would have purchased for my husband if it had not been provided for review. LEGO Play Book: Ideas to Bring Your Bricks to Life is a unique book that helps LEGO lovers actually play with their builds instead of stopping the fun once the building is over. LEGO Play Book does not provide instructions for building every image, but it does guide the builder with simple, medium, and complex models. Challenges are throughout the book with some extra guidance for some really fun builds. Filled with beautiful LEGO photographs, this book is advertised to feature more than 200 builds. 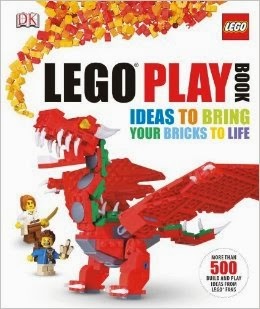 With five different themes and six builders/designers this book provides plenty of inspiration for imagination and play. I know Brother and Sister will pour over the images in this book and ask for help building some of the complex designs. Others they will complete on their own. If you are the least bit interested, LEGO Minifigure Year by Year and LEGO Play Book are both 50% off at Amazon ($20 and $13) at the time of this writing. I highly recommend for the LEGO people in your life!! Apparently this is the week of LEGOs! Did you see the personalized LEGO tray I made? Or our simple LEGO storage? A friend recently shared about a few other LEGO books that you may be interested in reading. Thank you, DK Publishing for providing our family hours of enjoyment with these books! DO YOU KNOW WHAT LEGO IS COMING OUT WITH IN JANUARY!? Friends style Disney Princess LEGO sets. I'm just a wee bit excited. :) First up on MY list is Rapunzel's Tower.